Since leaving Lettopalena, Italy, as a teenager, Carmen Palmieri has never wanted to return to the country of his birth, preferring instead to remember the tiny mountainous village in the Abruzzi region as it is in his mind's eye. One of the enduring pictures for the 89-year-old Palmieri is that of a celebration, a town wedding at which women of village including his grandmother, would toss colored almonds, money and pizzelle from their balconies to the revelers on the streets below. Festas in Italy call for luscious sweets, or dolce, and in the case of marriages, Christmas, Easter or other religious events, it is pizzelle that mark the day, particularly in the towns dotting Abruzzi, where they have been made for centuries. The lacy waffle-like cookies that resemble snowflakes or doilies are typically flavored with anise, and their delicate designs are often customized to reflect the particular woman or family who bakes them. Italian immigrants carried the tradition, the recipes and the art of making pizzelle to America. 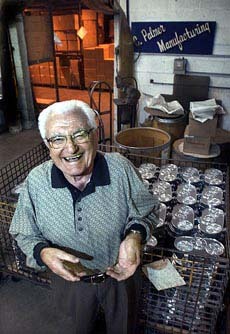 And it is Palmieri who has played an integral part keeping the tradition alive for 65 years, by manufacturing tens of thousands of pizzelle irons, first the hand-held kind and, later, electric ones. Today, the Palmer Pizzelle Iron is the only American-made pizzelle iron on the market. Palmieri, of West Newton, is, if you will, the godfather of the business, a man who is part storyteller, part philosopher, and unabashed, mischievous flirt. At his age, he's allowed to be. Although Palmieri has turned over day-to-day operations to a younger generation, he still goes to work every day from 7 a.m. to 3 p.m., keeping an eye over the business that started with an experiment in his basement and now includes the manufacturing plant in nearby South Huntingdon and one in Maryland. "All the things I wanted, my boy let it happen," he said waving his hands expressively and referring to his son John, 65. "You put that in. I started out, but my boy made it happen. The boy and my grandson made it what it is today." Palmieri was just 15 when he left his mother in Italy and came to the United States with nothing more than a third-grade Italian education. He joined his father, Giovanni, a naturalized citizen who had come seeking a better life two years earlier. The elder Palmieri took a job at a coal mine in Westmoreland County. Father and son took on the back-breaking work together after Palmieri lied about his age and got a job there, too. Just 3 1/2 years later, tragedy struck when Giovanni Palmieri was critically injured at work. He died three days later, leaving his son to make his own way in the world. He was 18. Though he lacked a formal education, the young Palmieri had a natural curiosity, innate intelligence and deft hands. He watched other men. He listened. He asked questions. He developed the skills of a master machinist, a talent that would serve him well in the coming decades. Even with today's 21st-century technology, when equipment at the plant needs to be fixed, adjusted or made to work better, the nine employees can count on Palmieri to study the problem and find a solution. "He makes everybody's life easier," said his granddaughter, Darcy Palmieri Smouse, who manages the South Huntingdon plant. Palmieri's abilities were such that the U.S. government granted him four deferments during World War II, preferring instead that his skills be used toward the massive supply effort under way in the Mon Valley industrial plants, including the radiator factory where he worked after leaving the coal mine. "I see what other people does, and I learned how to do it," Palmieri said simply and in broken English. By 1936, Palmieri had married, and he and his wife, Helen, settled in West Newton. Palmieri dug out a basement in their house, and he liked to go there to tinker with tools and equipment. One day he decided to improve a hand-held pizzelle iron he had purchased. He didn't like the design on the metal plates, where the batter was poured, so he decided to make his own. With nothing more than three sacks of molding sand, 4 1/2 pounds of aluminum and a coal furnace, Palmieri crafted his own mold with a flower design. "I changed the design. I didn't like the way it look. I change that to suit me, to look better." He was shaking when it came time to open the mold. "I hate to open it," he said, laughing. "I didn't want to be disappointed. But I wasn't. It come out good." The success in the basement gave Palmieri the incentive to produce his own hand-held irons. He built his own foundry in the back yard and went to work. He carried the irons himself by bus or train to the Strip District, where Italian grocers, such as Pennsylvania Macaroni and Sunseri Brothers, agreed to stock them and advised him about business. Palmieri streamlined the production process to cut costs, Americanized the name to Palmer and, after some initial mistakes, learned how to price the hand-held irons appropriately: $2.50. He was so confident about his work, he offered a 10-year warranty, which the company still honors today. Before long, Palmieri's backyard foundry was too small for the work. Twice over the years, he expanded. By 1965, Palmieri outgrew the back yard and moved his operations to a modern facility in the rural countryside above West Newton and, with his son's help, transformed the business. Sand molds have given way to die casts. Computers are an integral part of the operation. And the tiny coal furnace is now a massive gas-fired piece of equipment fed by 1,000-pound ingots of aluminum. The foundry operations expanded, as did the company's product lines, but while changes have occurred over the decades, the pizzelle iron and variations of it are still part of the company's catalog. This year two new irons were added -- one that makes three smaller round cookies and another that makes three oval cookies. As he looks back on six decades in the business, Palmieri smiles and refuses to take credit for his success. Above all else, he is a deeply religious man. America, he says, gave him opportunity. But he thanks God for the life he's had. "You never walk alone, and you never say I," he said glancing upward. "Say we did it. We did it."